FIGURE 34 Mucous membrane pemphigoid. Positive Nikolsky sign was observed on the lower lip after retraction to facilitate oral examination. Note the adjacent, collapsed, crusted bulla. Source: Courtesy of Charles Dunlap, DDS. 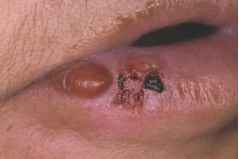 FIGURE 35 Pemphigus vulgaris. The lesions of pemphigus vulgaris typically exhibit a posterior location in the oral cavity. Note the collapsed intraepithelial bullae on the buccal mucosa and the lack of keratotic striae that would be typical of erosive lichen planus. topically, using a custom flexible tray of the type used for topical fluoride application for dental caries prevention but extended to cover the gingival soft tissues. Linear IgA disease may present as desquamative gingivitis (29). Please refer to the discussion of the individual disease processes that often present as desquamative gingivitis (erosive lichen planus, MMP, and PV).